Whether you're self-applicating with a backpack sprayer or an ATV sprayer for a personal food plot, a high fence farm or commercial hunting lease, our product comes in a liquid form that just needs to be mixed with water, it is quicker and easier to apply than most other products on the market. Our 100% natural Buck Bribe fertilizer is perfect for your food plot whether you're planting your high protein perennial seeds, such as white clover, red clover, chicory, alfalfa, winter wheat and others or you're planting your high carbohydrates Annual seeds such as turnips, corn, wheat, rye, radishes, crimson clover oats, or a mix of the two. Not only is our product great for the crops you'll be growing for your food plot but since it increases ground coverage, root length and drought resistance it is a perfect product to add structure to your plot to make those hungry does that are feeding on it feel comfortable and protected while they eat and force those big bucks to venture into the center of the food plot looking for those does and right in your kill spot! Compared to AG lime that takes tons of product per acre, large heavy trucks and spreaders on your land and convincing a lime company to truck and spread on a small acreage food plot. Buck Bribe is compact and easy to apply with only 2.5 to 3 gallons per acre simply using a back pack sprayer ATV sprayer or tractor. For decades ag lime has been used to raise soil pH levels and restore calcium saturation to the soil. This method, although over time can work, is slow, expensive and no longer the most efficient way to raise soil ph. Bio-Liquid Calcium is a liquid form way to provide the same results as lime but in a faster more effective way, all while being on average half the cost of dry lime. Liquid Calcium has been studied and proven by 9 land-grant universities that back the effectiveness of liquid calcium in fixing soil conditions and improving growth. AgriTec is a family-owned company since 1976 and has helped thousands of hunters around the country in the past 5 years, save money on lime and fix soil ph. Buck Bribe Liquid calcium: for neutralizing soil acidity and balances pH is mixed with micronutrients and organic matter to boost plant photosynthesis and increase carbon energy in the soil to boost root growth, increase drought resistance, Increases Movement of N-P-K into the plant, is also a Soil aerator which will reduce compaction and soften up hard plate soil, Assists plant production of proteins and Improves effectiveness and efficiency of fertilizers. Soil pH is primarily an indicator for many combined issues in the soil. These issues can equate to seriously decreasing soil production and decrease the output of your fields. Calcium has many roles in the soil and the plant, aside from directly affecting pH. Calcium is responsible for the nutrient availability and uptake to the plant. 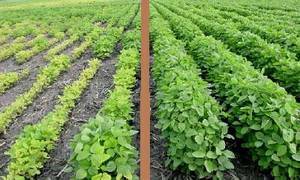 Decreased soil pH can reduce the availability of nutrients in the soil by as much as 50%. When calcium is applied, and pH is raised these nutrients are released and become available to the plant, providing much better growth. This issue also directly affects fertilizer, when fertilizer is applied to low pH soil, half of that fertilizer is wasted and will not be available to the plant. This equates to wasted money and lost production potential. Why use tons of lime on your fields that won't be available to your soil or plant for at least six months to a year or more when you can use 2.5 - 3 gal of Buck Bribe Liquid Calcium per acre which is 100% available after being applied. 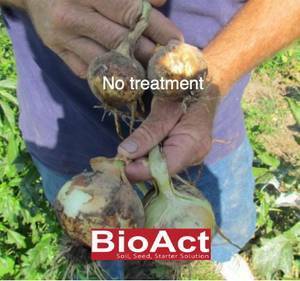 This is the best way to treat winter cover crops or prepare for next years growth. "Our wheat rye oats and millet BioActivator program has proven to deliver 22% to 40 % increase in bushels per acre. It also inhibits fungus, mildew, leaf rust, spot block, root rot... "
"I wanted to let you know this was a field that we separated and treated half with you liquid calcium last fall. To say the least I am very impressed. We got 7 round bales per acre off this field and last year it was only producing around 4 bales per acre. Thanks again!" - John K.
AgriTec will ship your order directly to you at no additional cost. Call to speak with local soil advisers for pricing and more information on using liquid calcium to raise your soil pH levels and add liquid fertilizer to your growing program to more effectively add nutrients to your soil.